If you haven't already heard, it's now official. Monsanto's request to have the EPA raise allowable levels of its herbicide glyphosate in food you may soon be eating has been approved [see Final Rule]. Public commenting is also now closed, not that it was anything but a formality to begin with. Notice above, the proposal includes "Add wiper applicator use over the top to carrot and sweet potato," revealing that one reason why Monsanto wants tolerances on glyphosate raised is because this chemical will be applied directly not just to Roundup Ready plants but to non-GMO crops as well, virtually guaranteeing that unless you eat 100% USDA organic concentrations of grave concern will end up in your food and body. "EPA has concluded that glyphosate does not pose a cancer risk to humans. Therefore, a dietary exposure assessment for the purpose of assessing cancer risk is unnecessary." According to this ruthless logic, since the EPA designates itself a higher authority than the independent scientific evidence clearly signaling glyphosate's carcinogenicity (view the toxicological data yourself here ), it requires no safety testing. Let the exposed populations eat Roundup Ready cake and fester in an epidemic of cancers, as it turns a self-blinded eye to the problem. 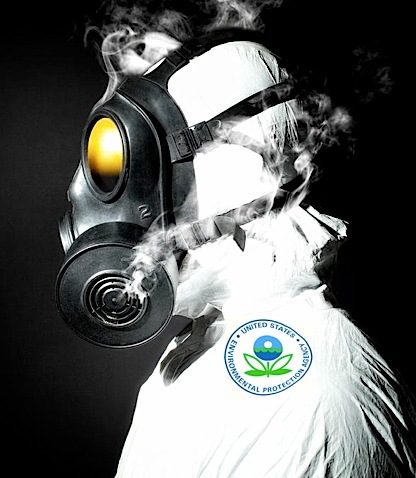 The EPA has just made such a mockery of its own mission statement, which is "to protect human health and the environment," that one wonders why they have not already declared themselves a wholly owned subsidiary of Monsanto. The obvious reason why Monsanto and its 'EPA cheerleading division' successfully raised the tolerances of glyphosate in your food, is because the contamination is getting so bad they had no other choice. Either limits are raised, or Monsanto breaks the law (by contaminating our food and poisoning us beyond the "acceptable level of harm" already determined by the EPA) and the EPA is shown to be completely impotent to enforce anything resembling its mission statement. But despite Monsanto's latest apparent success, a growing grassroots movement comprised of millions of concerned citizens is defiantly expressing their own form of "glyphosate-resistance," armed with a growing body of published toxicological data linking the glyphosate herbicide to over 30 health problems . This movement is mirrored poetically by the "super weeds" emerging throughout the Roundup Ready monocultured farmland of the world. In both cases, the center of real power is shifting away from Monsanto back to the people who are realizing that unless they retake back control over their food, they will be coerced and poisoned into a form of biological slavery the likes of which this world has never seen before, and if it manifests fully, will likely never recover from. This page contains a single entry by sal published on July 4, 2013 11:58 AM. Rotavirus Vaccine: Diarrhea of Deceit was the previous entry in this blog. Before his Death, Father of ADHD Admitted it Was a Fictitious Disease is the next entry in this blog.